New Delhi: The Union cabinet is expected to approve 100% foreign direct investment, or FDI, in single-brand retail and 51% in multi-brand when it meets on Thursday. The approvals, however, will come with riders, according to the agenda note. The Companies Bill 2011 will also be taken up for discussion, says the note, a copy of which Mint has reviewed. In the case of multi-brand retail, fresh agri produce cannot be branded and 30% of the inputs have to be sourced from small enterprises. Multi-brand entities will have to bring an investment of $100 million (Rs 500 crore). As for FDI in single-brand entities, retail presence has to be directly through the owner. In July, a committee of secretaries (CoS) headed by cabinet secretary Ajit Kumar Seth gave its approval for 51% FDI in multi-brand retail. CoS also suggested that multi-brand stores source 30% of the value of their procurement of manufactured items from small and medium enterprises. Goldie Dhama, associate director, PricewaterhouseCoopers, said the entry of multi-brand retail is a win-win for all—existing retailers, consumers and farmers. “One, there will be substantial investment in back-end logistics such as cold and supply chains, lack of which results in a wastage of 30-40% of the total produce; two, consumers will be spoilt for choices and will benefit greatly from deals common to such chains; three, farmers will get a wide choice to sell as multi-brand retails are expected to source directly from them," said Dhama. FDI in multi-brand retail, he expects, will also help ease inflationary pressures and result in large-scale employment with better remuneration. 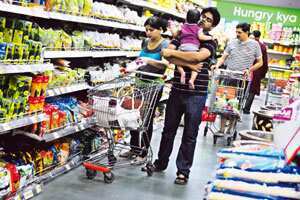 An inter-ministerial group set up by Prime Minister Manmohan Singh and headed by chief economic adviser to the finance ministry Kaushik Basu had backed FDI in multi-brand retail, holding it will help in moderating the high level of food inflation in India. Retail chains, too, say the entry of FDI in multi-brand retail will benefit the sector. “The Indian market is very large. A $100 million investment in back-end for a serious player, who wants to make an impact and create a supply chain, is not much. The investments required are much larger," said Ajay Sheodaan, customer management director, Metro Cash and Carry India Pvt. Ltd.
Metro was the first large global retailer to enter India when it started a fully owned subsidiary in 2003. The German firm operates eight wholesale stores in India, and earlier this month, it announced plans to open 8-10 stores in the country annually in the next four years, with an investment of around ₹ 2,400 crore. “The government has held extensive stakeholder discussions before forming these criteria. They are agreeable and should not meet with any resistance from international retailers," said Thomas Varghese, chairman of the Confederation of Indian Industry’s national retail committee and chief executive of Aditya Birla Retail Ltd. If the cabinet decides to approve FDI in multi-brand retail, the decision will come five years after it allowed 51% FDI in single-brand retail and 100% FDI in wholesale retail through the automatic route. “Allowing single-brand retailers only through ownership is a continuation of existing policy and on expected lines," said Dhama. Global retailers such as Wal-Mart Stores Inc., Carrefour SA, Tesco Plc and Metro AG have long been waiting to enter the lucrative Indian market. India, however, was unable to put together a consensus on allowing foreign investment in multi-brand retail because of concerns that this could wipe out small family-run stores. The cabinet is likely to approve the draft of the long-awaited Companies Bill 2011. The proposed law is aimed at making companies more accountable, while making it easier for them to do business with less regulation. The Bill, once passed by Parliament, is also expected to check fraud more effectively. The Bill was discussed in the cabinet last month, but sent back to the ministry of corporate affairs, or MCA, to incorporate some changes. “The ministry was asked to align a couple of discrepancies in the Companies Bill with that of Sebi (Securities and Exchange Board of India) Act, which have been taken care of," said an MCA official who did not want to be identified.